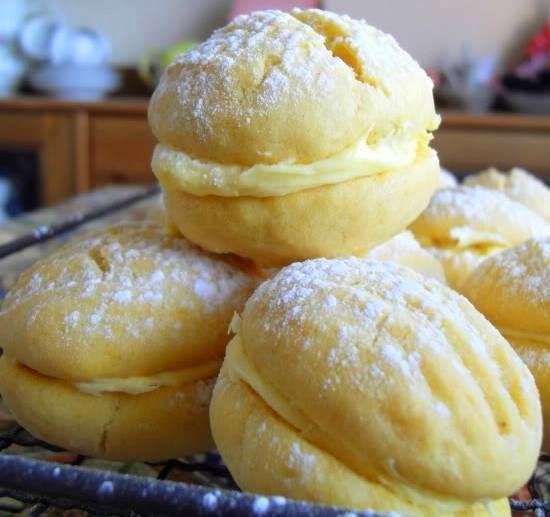 Delicious and buttery with a luscious custard cream center. Fabulous! Preheat the oven to 350 degrees. Line two baking sheets with baking parchment and set aside. Whisk the flour, cornstarch, baking powder and sugar together in a bowl. Drop in the butter and Crisco and cut into the flour using a pastry blender or two knives until you have something the consistency of sand. Beat the egg and vanilla lightly and then stir into the dry mixture, mixing it in well. Scoop out Tablespoon size pieces of the dough and shape lightly into balls between the palms of your hands. Place about 2 inches apart on the baking sheets. Press down with a fork which you have dusted in flour each time. Bake for 12 to 14 minutes, until well risen and set, but not browned. Transfer to a wire rack to cool while you make the filling. Cream the butter and vanilla, cornstarch and sugar together in a large bowl until light and fluffy. Be patient, it will come together eventually. If the mixture still seems a bit stiff, add a few drops of hot water and beat until you have the consistency you want. Sandwich two cookies together with the custard filling and set aside to enjoy later!